Being part of the Royal Shakespeare Company is still considered by many to be the holy grail of acting jobs, and every year, actors old and new collaborate on plays at the iconic theatre in Shakespeare's hometown. This year, amongst the scores of new faces in the current season, two stars of stage and screen are making their RSC debuts. Actors Kara Tointon and Adrian Edmondson, who have recently been seen in the likes of The Sound of Music Live and Star Wars: The Last Jedi respectively, are both appearing on stage in Stratford-upon-Avon for the first time, in Christopher Luscombe's production of Twelfth Night. I'm speaking to Tointon and Edmondson midway through their run in the famous Shakespearean Comedy, and ahead of the live cinema broadcast on the 14th of February, which will see the play beamed out to cinemas across the country. I'm curious about what it's like to perform at the RSC given its immense theatrical history, and taking into consideration how many amazing stage icons have trodden the boards of the Royal Shakespeare Theatre. Both actors agree that performing on that historic stage is bizarre, but for them, it's the play itself which is most daunting. 'On our first night they handed out a free copy of the programme to us' Adrian Edmondson recalls, 'and I was reading it before I went on, and it gave a list of all the famous people that’d played our parts before!' Indeed, Richard Wilson, Antony Sher, and the late Donald Sinden are just a few of the actors who played Malvolio in past RSC productions of Twelfth Night, meanwhile Mark Rylance famously won a Tony award for his performance as Olivia in The Globe's lauded 2012 production, when it transferred to New York. Kara Tointon adds that her agent saw Judi Dench in a production of Twelfth Night many years ago, although she played Viola. Both actors are also quick to comment on how unusual it felt, at first, to be performing on the Royal Shakespeare Theatre's thrust stage. Audience members and actors often mere inches from each other, and even at the back of the upper circle audience members are still relatively close to the stage. 'I keep waiting for a mobile phone to go off in the theatre' Adrian Edmondson jokes, 'so I can say ‘turn it off, they haven’t been invented yet!' The co-stars jokingly suggest that if a phone is going to go off then it'll probably be on the day of the cinema broadcast, although hopefully that won't be the case. Speaking of the cinema broadcast, both stars are hugely supportive of it, although neither of them have ever seen a piece of theatre in the cinema before. 'It’s a lovely way of introducing people to Shakespeare' Kara Tointon muses, 'we’ve been very lucky and we’ve sold a lot of our tickets, so it gives people who aren’t able to get to Stratford-upon-Avon a chance to see some theatre, and I think it’s great.' I wonder if either of them have any concerns about the cinema broadcast, assuming that the pressure to get everything right must be tenfold compared to playing to an audience in the Royal Shakespeare Theatre, which houses 1018 people when full. 'I hope I don’t fall over, that’s what I’ll be thinking about' Tointon chuckles, adding that 'something probably will go wrong – how fun! How interesting!' In general though, both agree that they'll be embracing the exceptional nature of the performance on the 14th of February. We finish the interview on a rather sombre note. 'Much like real life, everyone’s frustrated with their relationships. Really good for Valentine’s Day!' Edmondson jokes. 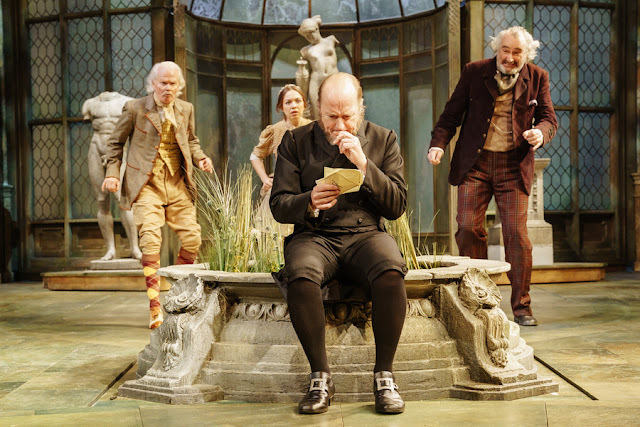 Despite the bleak fate of Olivia's steward, audiences can rest assured that there's plenty of romance and loads of laughs to be had in Twelfth Night at the RSC. The production runs until the 24th of February and will be broadcast to cinemas live on February 14th!